Clearly the General was talking about a battle plan, but I’ve heard this point paraphrased in regard to just about any activity. A lot of authors on a wide variety of topics agree with General Patton. What makes this so? I’ll call it “the perfection of information curve”. As you begin to learn or gather information, the quantity and quality of what you learn rises rapidly at first. As time passes, the rate at which useful new information comes in slows down; and gradually, the learning curve flattens out. Waiting longer yields only minimal improvements in the quality of the facts gathered. There is an optimum point at which good information can be applied to yield a good decision. That exact point isn’t defined. As public officials, we’re often faced with decisions that require us to obtain additional information from specialists. We depend on planners, engineers, public safety professionals, and others with specialized training and expertise to give us the background we need so we can decide and move on. Unfortunately, too often the public sector is plagued with the “paralysis of analysis,” so much so that it has become a punch line. Regrettably, this is somewhat understandable given the competing interests that frequently want diametrically opposing outcomes. It’s often easier to order another study than to make a decision. Sometimes this is easy. You know intuitively when you’ve got a clear picture of the facts and an answer seems obvious. In other instances, one or more interest groups is urging more study or advocating a completely contrary decision. Is this a legitimate policy choice or merely a delaying tactic? As I said, the optimum point isn’t predetermined. Your relationship with and confidence in those that advise you, as well as your own experience, are what you have to rely upon. Consider all the information you’ve received and then decide whether you have gathered what you needed, or whether you have not yet reached the decision point; but do whatever you can to avoid the “paralysis of analysis”. In my previous blog post, I discussed five of Robert Greenleaf’s ten principles of Servant Leaders. Greenleaf developed the concept by observing great leaders that he had known throughout his career. These were prototype servant leaders, even though it is doubtful that anyone ever applied that title to them. Servant Leaders have the ability to be visionary, and they raise the ability to be visionary in others. They can see both the long-term solutions and the short-term approach that should be taken. This is the difference between a mere “visionary” leader and a Servant Leader. A visionary leader may be the eyes for others, but a Servant Leader enables others to use their own eyes. It is this ability to see the big picture that gives both perspective and peace in turmoil. Servant Leaders are intuitive and have a way of being able to make decisions that are based on the past, present, and the future. Some leaders make decisions based solely upon the past. Others seem oblivious to the past. Servant Leaders develop an appreciation for all three components of time. This is called wisdom, and if a leader can lead with genuine wisdom, he/she is providing a great service to both individuals and the organization. Servant Leaders understand they are entrusted with things that are not their own, and that their legacy will ultimately be tied to how trustworthy they were with those things. It’s not just financial assets for which Servant Leaders must give an account; it’s also intangible things such as: culture, values, morale, credibility, and influence. Greenleaf wrote that the best test of Servant Leadership was simply: Are the followers growing as people and are they, while being served, more likely to become servants themselves. The Servant Leader understands that the leader is responsible for more than just the bottom line. To borrow a thought from a more recent book, he/she is a “Multiplier”. The Servant Leader makes developing those around him/her a major priority. The Servant Leader builds true community by inspiring people to work towards a shared vision. Relationships are forged around a vision that sustains the human spirit, recognizes the value of every person, and creates synergy. Rosabeth Moss Kanter has suggested that the most radical thing a leader can do is to connect people to others, and the Servant Leader is intentional about fostering relationships. No organization ever suffered from having too many Servant Leaders. If you want to raise your value, become a Servant Leader. If you want to raise the value of your organization, transform it into a team of Servant Leaders. When looking at the SMART goals acronym, the “A” typically represents making sure work goals are attainable. That is wise counsel. If you don’t believe me, consider the following example. Consider another possibility. What if I said, “It’s a beautiful day outside. Care to walk around the complex with me during lunch?” In that case, scheduling might be an issue, but the goal is much more attainable and may actually be enjoyable. 26.2 miles? Not so much! Define “attainable” – Your definition of success and your employees’ ability to be successful may not be the same. As you identify personal or employee goals, be realistic. That doesn’t mean we do not push, but it does mean we do not push too hard. Communicate – Goal setting should be established within a conversational framework. Do not just tell employees what their goals are. Instead, invite them to participate in goal formation as a means of providing ownership. Negotiate – Give employees time to think about the goals you are proposing. They may need a day or two to check schedules, process work loads, consult with other project managers or supervisors, etc. Your idea may truly be great, but it may need to be placed on the back burner for a few weeks. I would much rather wait and improve chances of success than launch and see enthusiasm derailed by lack of resources. Re-negotiate – As you walk through the SMART goal process, reassemble your team after a week or so and see if your definition of attainable remains accurate. If not, renegotiate attainability expectations. If you sense the bar was set too low, then raise it slightly. If you feel it was set too high, then back off just a bit. If your employees look like marathoners in training, then enjoy the run! Let’s keep the conversation going. How do you define attainable goals and what outcomes do you see as a result? It isn’t the changes that do you in, it’s the transitions. They aren’t the same thing. Change is situational: the move to a new site, the retirement of the founder, the reorganization of the roles on the team, the revisions to the pension plan, etc. 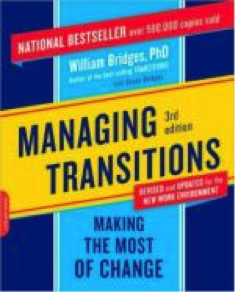 Transition, on the other hand, is psychological; it is a three- phase process that people go through as they internalize and come to terms with the details of the new situation that the change brings about. Don’t Be Surprised at Overreaction. “Overreaction” also comes from the experience that people have had with loss in the past. When old losses haven’t been adequately dealt with, a sort of transition deficit is created—a readiness to grieve that needs only a new ending to set it off. What they are actually reacting to is one or more losses in the past that have occurred without any acknowledgment or chance to grieve. Overreactions also take place when a small loss is perceived as the first step in a process that might end with removing the grievers themselves. Someone whose job seemed secure is dismissed, and 100 coworkers begin to wonder, Am I next? Learn to look for the loss behind the loss and deal with that underlying issue. All three are important, critical to the success of managing transitions. The place to start is here: What are the people losing? There are important lessons we can draw from this excellent book. People are people—with human fears and human needs. Among these are: people need someone to know, and something to do. Don’t ignore these basic human realities/needs. Treat your people like people, especially in periods of transition. Remind your people that every organization’s lifecycle is one of constant change, thus constant transition. Some are major, some not-so major. In other words, constant, perpetual, “nonstop” change is the way of the world. But, this fact—that the way of the world is nonstop change and transition—does not mean that people can “skip the process” of letting go, “floundering/wondering,” and new beginnings. And leaders ignore this understanding and skip necessary steps at great peril to the health of the organization (and the psychological health of the actual people). Robert Greenleaf popularized the phrase “Servant Leadership” with his book by that title published in 1970. He observed that being a Servant Leader started with a desire to serve the needs of others, and that this desire to serve was the person’s first priority. These kinds of leaders possessed ten common characteristics which became the ten principles for Servant Leadership. It makes sense that one of the best ways we serve others is by listening to them. A Servant Leader attempts to listen actively, with an open mind, and gives the gift of acknowledging worth to others by treating them as people who have something worth hearing. A Servant Leader attempts to see things from the other person’s perspective. 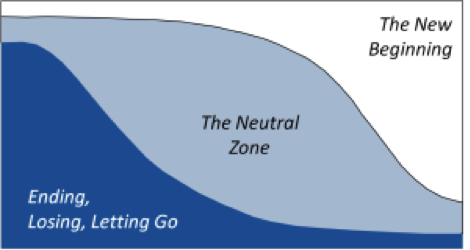 To borrow from Steven Covey’s writings, he/she seeks first to understand and then to be understood. This is the opposite of what we often see in the marketplace of ideas where one of the most common practices is to suggest in covert and overt ways that those who oppose you have absolutely no legitimacy. Servant Leaders don’t resort to positional authority or coercion as a means to accomplishment. Instead, they persuade others to follow them. This approach demonstrates that the leader trusts the followers to come to the right conclusion when given the right information in the right way. As the leader extends trust, it causes followers to have more trust in the leader. Greenleaf considered this to be the most powerful principle. The Servant Leader recognizes that people have the power to make wholeness out of brokenness. Perhaps more importantly, the Servant Leader accepts the responsibility to be a healer. Healing is, in some ways, the result of some of the other principles such as listening, empathy, awareness , and even persuasion—in that it implies treating people with dignity. It’s helpful to remember that Greenleaf saw Servant Leadership as a philosophy of leadership that guided the leader’s daily decisions and interactions. At first glance, the term Servant Leader seems like an oxymoron. Are you the servant or the leader? Can you be both? On the other hand, it’s intriguing to think about what kind of difference this type of leader could make in your organization, isn’t it? Stay tuned for the other five characteristics of a Servant Leader later this week! If you have an iPhone, you probably received a prompt to upgrade your operating system to the latest version. As with any new Apple reveal, there will be cheers and jeers; but ultimately, everyone will get used to the new norm and comply. As annoying as that sounds, isn’t that the true indicator of an innovator? Apple is the epitome of forward thinking and innovation because they set the bar and wait for everyone else to catch up. And that’s exactly how every 16% organization should be. Think about why everyone wants to work for Google. Word got around about the holistic approach the company takes to cater to the needs of its employees. The benefits provided—on-site physicians, travel insurance, extensive maternity leave, free legal aid, etc.—cannot be easily beat. Did Google wait for other companies to provide those benefits? No. They made an assertive effort to set the bar high and become one of the most sought after employers. So what’s the “stamp” you want your organization to have? What sets you apart from the rest? Don’t wait for another entity to do it before you jump on board. Be an innovator and take the leap to show that your organization is truly ahead of the curve. I’ve been preparing the material for a class on Servant Leadership, and it’s given me the chance to read and re-read some of the writings of Robert Greenleaf. Greenleaf, who had a long career with AT&T from the 1920s to 1960s, wrote the book Servant Leadership in 1970. Today that phrase is used a lot in many sectors, and sometimes it’s used without much explanation as to exactly what is meant by it. It seems that most people assume the meaning is self-explanatory. However, in Greenleaf’s writings, he paints a much clearer picture of what it actually means to be a servant leader. They needed to be leaders, but they chose not to be. They chose to lead, but not as servant leaders. They agreed to follow leaders who were not servant leaders. He said that if you could magically remove all of the “bad people” and if you could have the perfect organization, that it wouldn’t work, matter, or last—unless you had an adequate number of servant leaders. In other words, without servant leadership, any system would fall apart and every organization would become corrupted. For that reason, he suggested that while developing leaders should not be the only priority of a healthy organization, it should be the first priority of every organization. Reading through his material, I kept thinking about my experiences in some of the really poor neighborhoods in large cities in Brazil. I love Brazil, and I have been there many times. It’s a marvelous country. One of its challenges, though, is the neighborhoods that have been built without government authorization. I’ve been in some of them. In many of those neighborhoods, there were no organized sanitation services. The trash was just accumulating into large piles—sometimes in the middle of the street! It’s a complex situation, but as I look back, I think of it as a sort of metaphor of what happens when there aren’t an adequate number of servant leaders. In spite of all of the problems, the presence of more servant leaders would have made a big difference. My guess is that’s probably the same in your organization. No matter how complex the problems are, it’s likely that more genuine servant leaders would make a big difference. How Do You “Measure” Success? In my last blog post, I noted that I am a fan of SMART goals. In case you missed it, SMART is an acronym for goals that are specific, measurable, attainable, rational, and timed. We also noted the importance of setting specific goals—even in the context of daily work tasks. We pointed out that lack of specific instructions can lead to wasted time and energy while contributing to frustration and rework. The same is true if goals are not measurable. Let’s explore! Begin with the end in mind – If you are going to build a house, you do not begin by starting construction with hopes that the house will take shape over time. You begin with a set of blueprints—a detailed visual map—that accounts for every inch, angle, corner, support, etc. I fear many employees simply begin work by jumping in without setting a standard for a successful day. Try beginning your day by looking at what you want to accomplish by the end of the day. How can we do that? Make a daily “to do” list – You may think that is old fashioned and a total waste of time. However, the law of gravity has been around for as long as I can remember, and I still think it is a great idea to not step off a cliff! Just because a tool has been used in the past doesn’t mean we need to think it no longer has applicability. A “to do” list provides a means of measurement to help you know when a work goal has been completed. Make a weekly “to do” list – A weekly “to do” list helps you prioritize your daily “to do” lists and provides a context for collective work projects while allowing you to build in maintenance time for unexpected calls, emails, customer issues, etc. Identify or ask for desired outcomes – If you are a supervisor, provide measurements for success and discuss those openly with your direct reports. If you are a direct report and you do not have clarity on a definition of successful work, ask your supervisor. Regardless of your position, you may need to negotiate expectations on measurement criteria. We’ll explore that more next time when we talk about making goals attainable. Consider this your quick customer service reminder of the day. It’s from the 2005 book Overpromise and Overdeliver: The Secrets of Unshakeable Customer Loyalty by Rick Barrera. If unshakeable loyalty is your goal, overpromising and overdelivering should be your methodology. After brand promises have been established clearly, managers need to get their entire organizations aligned to deliver flawlessly on those big promises and, above all, consistently, every day, with every sale or interaction. … When you overpromise you are putting your whole reputation for honesty on the line. You are saying that you are confident your brand will perform, and you’ve made a solemn contract with hundreds or thousands or millions of customers. If even a few customers find you reneging their contempt may well spread like a California wildfire… The price for squandering trust – sabotaging a brand’s promise – is always too high to pay, because at the end of the day, the priceless intangible called integrity is the richest asset on any company’s balance sheet. So, here is your customer service and organizational success reminder of the day: overpromise; then, overdeliver. It also works in local governments to keep the citizenry satisfied. And, in case you can’t tell, this is not all that easy to actually pull off. Leaders often say that the most difficult part of annual evaluations is having that conversation with that employee who is under-performing. There are a number of reasons why many managers find it hard. For one thing, they know that in most cases, it’s not going to be well received. Let’s face it. No one wants to hear that they aren’t doing a good job. Managers also fear the evaluation will be contested, and the disgruntled employee will make things worse by their attitude, which will affect the work of the entire team. On top of that, everyone fears the threat of lawsuits. What often happens is that instead of having an authentic conversation with this kind of employee, managers tend to place their marks to the middle. Instead of being honest about the manager’s perspective on the employee’s performance, they mark the form a 3 out of 5, which labels the employee as average. This is often accompanied by very few comments or written remarks. So is the problem the evaluation form itself? Well, not necessarily. It may need to be improved, but the real problem isn’t the form—it’s the culture. An unwillingness to have a frank discussion with employees about performance reflects a culture that doesn’t truly value accountability. And without accountability, mediocrity is much more likely to infect the organization. That’s because accountability, along with encouragement, is absolutely necessary for workers to do their best. Confront problems when they arise. Don’t wait until it’s time for the annual evaluation. Have an honest conversation at the earliest possible moment. You may dread it, but if you put it off until the evaluation, it will only be worse. A friend of mine who is a City Manager says, “Bad news doesn’t get better with time.” He’s right. Can you imagine a football team that waited until the end of the season to point out a player’s mistakes or areas where he needed to improve? The only way to improve is to identify your mistakes and develop a plan to overcome them.